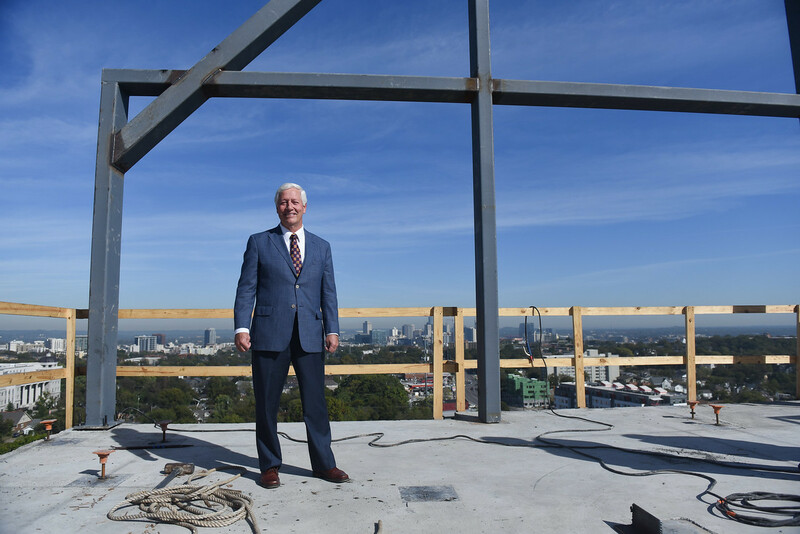 Dr. Fisher celebrates the "topping out" of the new Hall Hall dorm at Belmont University in Nashville, Tenn. October 20, 2017. The gable for “Tall Hall” is lifted into place. Ten months after breaking ground, today Belmont University contractors lifted the north gable in place on a new residence, “Tall Hall,” that sits between 12 South and 15th Avenue. The topped-out structure’s top floor, based on overall elevation, represents one of the highest points in Nashville, offering tremendous birds-eye views of downtown. At more than 243,000 square feet, Tall Hall will be the institution’s largest residential building to date and is scheduled to open in phases with about half of the facility welcoming students in August 2018, with the remaining space finished by January 2019. The $80 million complex will house 611 upperclassmen in total and will include a fitness studio on the ground level to provide workout opportunities close to students’ homes. In addition, a large park-like green space is being added beside Tall Hall between Dickens, Horrell, Russell and Thrailkill Halls. The area will feature a flowing stream, a small pond, seating spots and a green recreational space. Dr. Fisher speaks during the celebration “topping out” of the new Tall Hall dorm at Belmont University in Nashville, Tenn. October 20, 2017. Approximately 55 percent of Belmont’s undergraduate population currently lives on campus, and the new hall will increase residential spaces from approximately 3,500 currently to more than 4,100 spots. The new facility will feature both suite and apartment-style room options and will be located in the southeast quadrant of campus. Nashville-based R.C. Mathews is the contractor and ESa the architect for the project. Belmont continues its commitment to sustainable buildings with this project, as this is expected to be the fourth campus building to achieve LEED certification. Occupancy sensors, nearby material sourcing, variable refrigerant flow (VRF) HVAC system and low VOC paints all contribute to ensuring less impact on the environment from this new construction. Belmont’s continued campus growth—with investments exceeding $600 million in construction, renovation and property acquisitions since 2000—is matched by an enrollment surge that finds the University topping 8,000 students for the first time this fall.